I cannot believe how fast my kids grow out of clothes. I’ve always been a bargain shopper, but lately it’s been extreme because I’ve had to buy so many! There are a few things I do when shopping for clothes or shoes, whether it’s in the store or online. Ebates: This is a website which gives a percentage back on what you spent at a specific store. For example, I can go to Ebates, search for “Carter’s” and see that they haev an offer of 3% back. It’s not much, but if you’re shopping at that sight already, it’s perfect and after a few months you have a nice check to be mailed to you! My total is at the bottom right there…already $41 saved up! SIGN UP! Thrift/Consignment Shops: I love shopping at ThredUP because it’s secondhand designer clothing at SUCH a great discount. I love shopping for Janie & Jack pieces, Nike, J.Crew, and Lily Pulitzer. It comes in the packaging like new. I would never have thought any of the items I have received were secondhand. 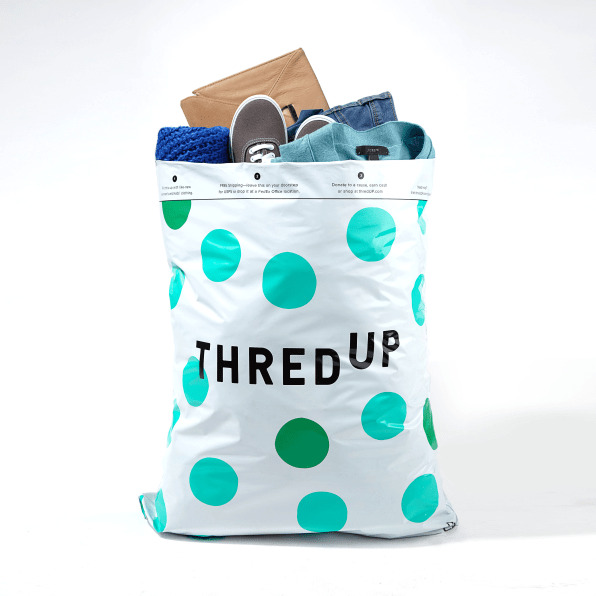 You can ALSO send a bag of your old clothes to ThredUP and receive a payment for the clothes you donated and that sell. Discount Code Hunting: I love shopping for coupon codes and one of my favorite spots to look is at Hip2Save. They have so many deals at the disposal of your fingertips. The code is there and everything! If you can’t find anything on that website, try plugging in the store you’re shopping at into RetailMeNot . I usually always find codes for Kohl’s, Carter’s, and even Papa Johns! Some might say this is a lot of work, but it’s really not, and if you want to save some money it’s worth it. I really hate paying full price because everything is overpriced these days and if you can get it for less, why not? Couponing in Store: I know everyone gets those Kohl’s coupons for 30% in the mail, so if your kids need clothes, use them! Just shop smart. Go to the clearance or sale section and get some staple items. I get a lot of staple items that I can mismatch with other things. If you shop online, you can stack the 30% off coupon plus any others that you find. JC Penney’s also mails out a lot of good coupons, especially the $10 off $25, Again, go to the clearance section! It wouldn’t really be worth it to buy a full price outfit for $18.99 and then a $12 shirt. If you can buy several things for $25, and then get the $10 off your money is much more well spent! Clearance: I try not to go to Target and shop all the new clothes! It’s hard, but I head over to the clearance section and don’t even LOOK at the other stuff. Even when I shop at Marshall’s or Ross I always look at the clearance section first. I do this for myself and the kids actually. This outfit was mine when I was little, so if you have any old retro clothes, let your kids wear them! This romper is adorable! Overalls are so cute and I can pair pretty much any shirt with them for Bailey. I got this from Children’s Place with a coupon code. That’s another great store to use coupons on! Typical fall outfit! I love the black leggings and chambray shirt vibe…still! I hope it doesn’t go away! This vest was a hand-me-down and I def got my use out of it! The boots were also given to me, so if you have friends with older kids, maybe they’ll pass some clothes onto you! Like I said, I love a basic staple piece and these items go with everything! I love pairing this skirt from Old Navy with a white tank top or even a patterned shirt. Harper is always in basketball shorts and tees because it’s just adorable. I get his plain tees from Hobby Lobby! Although I love shopping for deals, there are plenty of small shops that I really love supporting. They are all affordable and my kids have gotten their use out of them. Here’s some of my favorites! Where is your favorite place to shop and how do you save money? Thanks for stopping by! Be sure to subscribe to my blog and drop a comment saying hello!